Following on from my previous post on XUnit I decided to look at the Extensions library associated with the XUnit.net framework. The XUnit Extensions project is available from http://www.codeplex.com/xunitext and is a separate assembly containing additional attributes (and I guess additional assertions later) and contains some really cool features. To use the extensions, you need to reference both xunit.dll and xunitext.dll. Currently, there are six main extension attributes included within the assembly. To start with, I will look at the most basic – InlineData. The InlineDataAttribute allows us to specify data to use within the test, executing the test each time for each attribute – similar to MbUnit’s RowTest. Below is a test which verifies that the length of a string is as expected. Using TestDriven.NET, each attribute causes a separate test to be executed with the output shown below. This is great for reducing the amount of duplicate test code and really helps readability as if you want to add additional test cases you just include another attribute. Sadly, the ReSharper plugin just thinks this is a single test – instead of three separate tests like TD.net does. Having it just as a single test makes it difficult to identify the failing test. Moving on, next is the PropertyData attribute. Property Data allows you to specify a property which returns an IEnumerable. Below is my property which returns the same data as in the above test. I’ve hard coded the values, but this could some from another source to meet your own requirements. With the test, you define a PropertyDataAttribute passing in the name of the Property as a string argument. The test itself then should accept the same parameters as being returned within the object array (in this case, a string and int). The code to implement this is as below. When it hits the failing test, TD.net outputs the following. I think this might be a bug as the output isn’t as clean as Inline. ReSharper still threats this as a single test. failed: Exception has been thrown by the target of an invocation. >. However the advantage of this is what we can reuse the property in multiple different tests instead of redefining the test cases for each test like with Inline. The next set of attributes pull data from an external location. 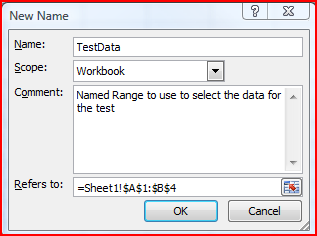 The first is ExcelData, this allows us to use a Excel spreadsheet as the source of the data for the tests. By using an excel spreadsheet, we can easily edit and maintain the test data separate to the actual code but it also removes any dependency on having a database setup to hold out test data. The test with the attribute would look something like below. 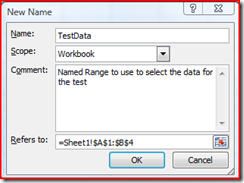 You specify the Excel file to use and then a query which will be used to pull the data, the TestData name is actually a Named Range in Excel so the test knows what data to use. The reason for this was because I hadn’t included the ExcelTestData.xls file into the project and set Copy to Output to Copy always. Important note – it must be a Excel 2003 format – not the 2007 format. Next is the SqlServerDataAttribute. This allows us to use data within a Sql Server Database and use a SELECT statement to return the test data we want to use within our test code. This is great when combined with a tool such as Red Gate’s SQL Data Generator. The SqlServerDataAttribute accepts either Server, Database, SelectStatement or Server,Database,Username,Password,SelectStatement. One important note, the amount of columns returned from the select statement must match the parameters of the test. Similar to MbUnit’s Rollback feature, the extensions library has an AutoRollback attribute. By adding this attribute to your test, the entire test will be wrapped within a transaction so once the test has finished (passed or failed) the transaction will be rolled back meaning any changes will be undone. For example, if we delete the entire customers table, once the test has finished the changes will be rolled back – leaving the database in the same state as before the test. This is very important for test isolation as we want each test to be independent of any other tests, when it comes to interacting with the database we especially don’t want any tests making permanent changes to the database which is used by other tests. The Rollback attribute also includes additional properties, IsolationLevel, TransactionScopeOption and a Timeout. Unit testing anything to do with the system clock is always difficult! The problem is that you don’t know what time your tests will be executed, and you definitely don’t want to limit them to only running at one extract moment. In my article Beginning to Mock with Rhino Mocks and MbUnit – Part 1: ASP Alliance I spoke about mocking the date time to get around this. When I first heard about this I was intrigued how they managed to freeze the clock, turns out it wasn’t so special – but still useful. What the extensions framework provides is a Clock class which is a wrapper around the .Net DateTime class. It properties three properties to access the current DateTime – Now, Today, UtcNow. In your production code, you use this Clock class instead of DateTime to offer all of your date functionality. When dealing with dates, you would do something like below (of course, instead of outputting to the console you would do something real like query the database). To test this we would then add the FreezeClock attribute, which automatically freezes the Clock object for us. We then use the same Clock.Now method to access the now frozen time. Outputting both to the console, we verify that the two dates are actually the same – impossible with the standard DateTime. 1 passed, 0 failed, 0 skipped, took 3.56 seconds. However, I really really don’t like the fact that I would have to use the Clock class and reference xunitext within my production code. Just gives me a nasty feeling and I can’t imagine this is how Brad and James wanted it to be used. Instead, I would prefer to use a type of Dependency Injection (well Date Injection), passing in a DateTime object into the method under test. Our test now looks like this. Instead of letting the method obtain the time itself we give it the DateTime object (which we got from Clock.Now) to use. When we run the test, the date time is still the same and still frozen. However, if we are doing this why not just use the DateTime object itself? I think its something useful, but not sure if I like it. Assume Identify allows us to change the Current Principal (the user currently executing the assembly). This is used for various things such as Role management and within CAS (Code Access Security). What is outputted is nothing. If we use the AssumeIdentityAttribute, we can pass in a RoleName for which the user executing the test will be a remember of. If we run this test, what is outputted is the name of XUnit and IsInRole returns true. If a method we was testing involved CAS as below, the user exectuing the test would have to be a remember of that role – not always the case for build servers. With AssumeIdentity, the test can correctly execute the method. Adding Trace attribute to your tests causes the test name to be wrote out to the Trace listener before and after the test is being executed. Useful for debugging if your tests have a habit of stopped mid-execution. Finally, the RunWithNUnit attribute. This method actually lives in the xunitext.nunit.dll assembly. To check that I wasn’t going made, I created a separate project referencing NUnit 2.4, XUnit and XUnitExt.NUnit. I then use the XUnit console to make sure I’m executing under XUnit. However, I couldn’t get this to work correctly as I kept receiving an “error: Exception has been thrown by the target of an invocation. in TargetInvocationException” exception. I posted on the forum, but at the time of posting no reply. In summary, I hope you have found this post useful when getting started using XUnit.net and their extensions. Any feedback/comments then please leave a comment on the post. I blogged a couple of years ago on the motivations behind creating data-driven unit tests a couple of years ago, and finally got around to finishing an nunit extension for this (check out rakija). How much easier is it create extensions in MbUnit, and XUnit? I’ve never really looked at any other testing tools other than NUnit, apart from switching to VSTS as all developers had that as default. Hi, thanks for the comment. I’ll take a look at your extension when I get chance. Creating your own extension with MbUnit and XUnit is very easy. XUnit has the cleanest interface to extend from, but you would expect that as it’s the newest framework. But they both follow a similar pattern of implementing an interface. One of the nice things about MbUnit is that most of the attributes are already in place so there is less requirement to extend. Still trying to decide on the best approach on how to discuss the subject of extending frameworks – think I might do a series of articles. It would be great if you can attend the meeting. Not planning on discussing extending the framework but planning on showing all the cool features already in place. If you want to chat after then then i’m happy to, will have the MbUnit code on my laptop. Thanks for this run down Ben, much appreciated. Any chance of resurrecting the images for this post? Or, alternatively, attaching an example spreadsheet? BTW, forgot to say in my previous comment: Thanks for this excellent post, providing the necessary documentation for Theory that the xUnit.net people completely forgot to do!